As the competition is growing and the world becomes a global village, companies seek the help of recruitment consultant to find the candidate for the job. The recruitment consultant’s job is never going to end because companies always need help to hire the candidate and recruitment consultants give them right candidates to choose from. What is a Recruitment Consultant? When a company wants to hire a new employee they got so many offers for the job, but selecting the best one is the most tedious task as well as time consuming and costly, therefore companies choose to take help from the recruitment consultant. A recruitment consultant works with the different organization to provide them the right candidates to fill the job of temporary or permanent. 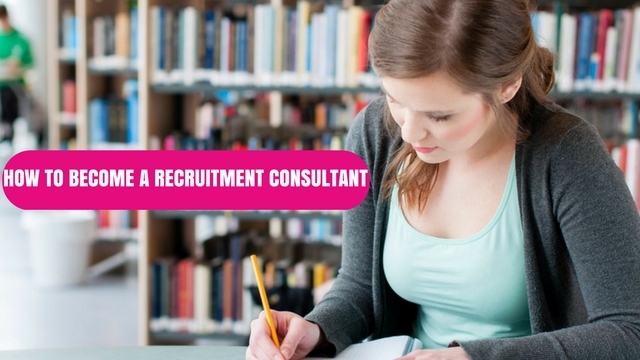 What Does it Take to Become a Recruitment Consultant? Recruitment consultant works with the company to provide candidates for the job, these candidates may work temporarily or permanently, that depend on the hiring company but recruiter selects the candidate on basis of recruitment consultant job description, according to the job, qualification and the requirement of the company and the candidate. Recruitment consultant gets good pay for the recruitment services and also bonus, if the candidate is good enough to settle for the long term. The job of recruitment consultant needs lots of time and energy to do the job. To become a global recruitment consultant, you do not need rocket science or any complicated educational background. The thing you need most to become a recruitment consultant is a passion for the job because recruitment consultant is one of the most demanding jobs and knowledge on how the business world works, which you gain from your college education and working experience in the business world. The experience you gain from your work actually helps the most because now you have an understanding of how things work and what they need. There are also degrees that are relevant to recruitment, but it is not mandatory to have any degree to work as a recruitment consultant. If you want to become a recruitment consultant from the scratch, then you should know no road is easy from the beginning, there are many bumps that may slow you down, but if you are set to do the job the success is definitely yours. And if you are the experienced one, then you already know the in and out of the business world, you can start with your network. The job of recruitment consultant needs knowledge of the business world and how things work as well as what exactly you want to work for. There is a large scope in the recruitment consultant, but again if you are ready to invest energy, time and dedication only then this job is fruitful. The growth in this job is excellent and you can start your own business after gaining experience and network, till then you can start to work with other job recruitment agencies which will give you much-needed experience. The first thing you need when you become the recruitment consultant is professionalism. Your professional behavior makes you the right choice when it comes to using a recruitment consultant for hiring the candidate for the job as well as professional behavior leaves no space for any misunderstanding and problems. Recruitment consultants work hard to make their image and to maintain contact as well as to satisfy their contractor. Maintaining a professional relationship is also important to grow your consulting career because you need others to grow your career which only came with the professional attitude. So maintain professionalism in your career to grow and to succeed. Do not try other than professional behavior because you need your professional skills to succeed on your path. A recruitment consultant spends most of his day by talking or interacting with another human being which includes potential clients, contractor and your business partners. The job of a recruitment consultant depends on the interactions he/she have throughout the day and the success of their job comes through these conversations. A positive attitude helps you get through the day and realistic approach helps in maintaining your positive attitude. A positive attitude is one of those things that keep you motivated and helps you get through a hectic day where most of your time spends interacting with people simply because recruitment consultant is one of the most social jobs where you meet hundreds of people. Another benefit of positive attitude is that your clients, contractors get a good impression of your working. The job of a recruitment consultant is all about hard work and dedication, especially if you are starting your career as a recruitment or employment consultant. A recruitment consultant needs to do research, make contacts, send a proposal and find best-suited candidates for the job which need hours and hours per day. A recruitment consultant works 40 hours a week on an average because of the workload and a number of hours go higher if you are new to the game. Be ready to work hard if you want a successful career as a recruitment consultant because the harder you work, the more successful you are. But be sure that your quality of work always remains high because this is what brings work for you. A recruitment consultant is all about networking and business relationships. When you start as a recruitment consultant, you need networking and business relationships as much as possible because being a recruitment consultant you get good offers through referrals and mouth publicity do wonders for their work. A bigger need is to focus on networking and business relationship if they want to succeed because the job of a recruitment consultant is a social job which needs good contacts and relationship to stay in the market. So to succeed as a recruitment consultant focus on the networking and business relationship, maintain them and cherish them. Grow your network to succeed, make a relationship to excel and give results to stay in the market. Good communication skills are the keys to the success of a recruitment consultant. Communication is the base on which recruitment consultancy depends on, a recruitment consultant interacts with so many people every day that he/she need excellent communication skills to get through the day. Good communication helps recruitment consultants through all the steps whether it is to develop the business, make the network or secures the contract. Good communication comes always handy in such type of job. You need to act polite, respectful and choose words carefully; good communication in recruitment consultant helps you in the long term. Good communication skills always work in favor of you no matter the years of experience and size of the business. You cannot work as a recruitment consultant without the cooperation from the others. It is the job that needs teamwork where everyone works to meet one goal. If you are one of those people who face hard times getting along with other people, then change your habits because a recruitment consultant needs to get along with other people in order to succeed in this job. A recruitment consultant is a job where you interact with different people on a different level for different task and to do your work successfully you need cooperation from the others. So to succeed in the job of recruitment consultant, learn to get along with the others, make your behavior polite and learn to forgive small, silly mistakes as well as learn patience and temper control. Never forget that work is full of people who are there to take advantage of you and they work so cleverly that in a first glance you will have a hard time to detect these frauds. A recruitment consultant is a field where the chances of fraud are higher than another field. You need to learn how to detect fraud and apply all the necessary precaution and steps to prevent such type of incidents. Always make sure to check and verify all the documents and look for those people with careful, watchful eyes. Always do backgrounds check, why the candidate is leaving the previous job, why a company is facing a hard time keeping new employees, why the candidate has a gap in the résumé, etc. are such question you should ask yourself and the candidate and the company. Try and find right answer of these questions and leave if you felt suspicious because it will only do damage to your reputation. Creating an exceptional job description is the part of your job because you want a candidate that best suited the job as well as know what they are doing. If you create a confusing job description, then you will face a hard time finding a suitable candidate and it will only cost you money that can be used in other tasks. A good job description has all the necessary information about the job, expectation, experience and work which helps in finding the suitable candidate with minimum efforts. So you should learn the skills to produce an exceptional job description to succeed in your recruitment consultant jobs. You cannot work well in the corporate world if you are not familiar with organizational and administrative skills, especially if you have to deal with the recruitment process of the people. Recruitment consultant needs to have organizational and administrative skills in order to succeed in this job and career path. Good organizational and administrative skills help in maintaining the job in the best possible ways as well as having an inside idea of how things work, so good organizational and administrative skills are needed to succeed as a recruitment consultant. The salary of a recruitment consultant depends on the number of years. If the number of years is greater then a recruitment consultant gets pretty much awesome salary, but a beginner can also get decent enough. Actually, the job of a recruitment consultant is needed and required all over the world, but their salary changes according to the country. The fact is a recruitment consultant can really earn a good sum of money and their experience pays them very well. On an average a recruitment consultant gets the salary of £16,000 – £20,000 as well as their income depends on the years of experience they have. A recruitment consultant is a job where the chances of growth are high; you can earn experience by working in recruitment for a recruitment agency where you gain the basic knowledge, recruitment skills, and understanding. Later on, you can move to larger recruitment companies or the firms that provide large business structure to work for and different field to gain experience. Recruitment consultant moves from a lower to a higher position with experience. You can also start your own business after gaining a few years of experience or work on a higher level for a large establishment. The career of a recruitment consultant needs lots of energy, especially if you are new to this field, but the progress and growth are good enough to keep you in for a longer period of time as well as you learn from your experience. In this article, we had discussed about becoming a recruitment consultant and we hope this article can really help you in your career path.